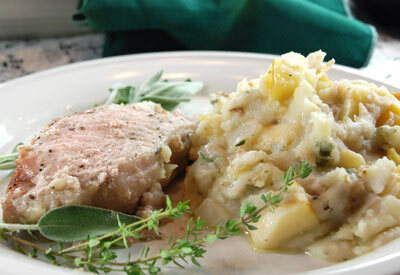 To mashed potatoes, add butter, onion, apple, sage, thyme, salt and pepper. Mix well. Rub pork with butter, salt and pepper. Pour cider or water into 3- quart casserole dish. Scoop potatoes into casserole dish. Place meat along edges of dish on top of the potatoes. Cover loosely with foil and bake 45 minutes. Remove foil and bake 15 minutes longer. Remove from oven and serve hot. Garnish each plate with a sprig of fresh sage and thyme.